Fernando Alonso became only the second driver this season to top both morning and afternoon practice sessions. (CNN) -- Fernando Alonso looks the man to beat at Monte Carlo this weekend after the Ferrari driver topped both practice timesheets for Sunday's Monaco Grand Prix. The two-time former world champion out-paced Red Bull's Sebastian Vettel and the Renault of Robert Kubica in the morning 90-minute session with a fastest time of one minute 15.927 seconds over the famous street circuit. Then, in the afternoon, the 28-year-old Spaniard recorded a time of one minute 14.904 seconds to become only the second driver this year to lead the way in both practice sessions. Alonso told the official Formula One Web site: "It's only Thursday, so the main aim was to understand how the tires work and get confident with the circuit. "On this track a major set up change might give you half a tenth, but trusting your driving can see you gain half a second. "There is still a lot of work to do and quite a margin for improvement. The track conditions will get better by Saturday." Nico Rosberg again underlined his rapid qualifying performances this season by finishing second, 0.109 seconds adrift, with Vettel -- who is aiming to claim Red Bull's six successive pole position -- in third place. 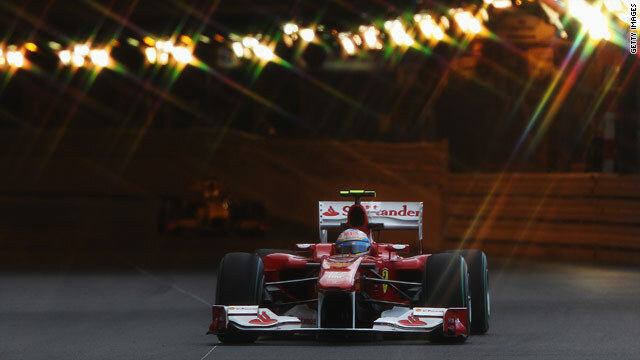 Alonso's teammate Felipe Massa was fourth quickest, just two-tenths of a second off the pace, with five-times Monaco winner Michael Schumacher in fifth position. The last two winners, McLaren pair Lewis Hamilton and Jenson Button who both won Monaco on the way to lifting the world title, finished seventh and ninth with Spanish GP Mark Webber down in a lowly 10th position.